Philippe Mius d'Azy was born 1660 in Pobomcoup, Cape Sable, Nova Scotia. He is the ancestor of the Indian branch of the Mius (Muise, Muse , Meuse) Family. Philippe Mius d'Azy married twice. Both of his wives were Amerindian women and Philippe's children lived among the "sauvages" on the East Coast in the 1708 census. Ref(1): Dictionnaire Genealogique des familles Acadiennes, vol:1 p.1206 Publication: Centre d'Etudes Acadiennes, Universite' de Moncton: Author: Stephan A. White. Ref(2): Histoire et Genealogie des Acadiennes, vols. I-6, 1639-1755 Publication: Quebec,Le Conseil de la Vie Francaise en Amerique,1965. Author: Bonaventure Arsenault. Francoise Mius was born 1678 in Cape Sable Nova Scotia. She Married Jacques Bonnevie.He was born abt. 1660 and died 23 April 1733. Reference: Dictionnaire Genealogique Des famillies Acadiennes Vol. 1[Bonnevie section], Author : Stephen A. White, Universite de Moncton. Jacques Bonnevie was born 1704 and died aft. 1760. He Married Marguerite Lord abt. 1729 in Annapolis Royal, Nova Scotia. Marguerite was born 19 Jan. 1712, in Annapolis Royal, Nova Scotia. Reference: Dictionaire Genealogiques des Familles Acadiennes, pg. 1102 [Lord Section]. Author Stepehn A. White. Madeleine Bonnevie was born 27 Feb. 1741 in Annapolis Royal, Nova Scotia. She Married Charles Richard in 1758. Charles Richard was born in 1738 in Amherst, Cumberland Co., Nova Scotia. Reference: Dictionnaire Genealogique Des Familles Acadienne, Vol. 1, pg 178. Author : Stephen A. White, Universite de Moncton. Charles Richard b.1738. He was the son of Michel Richard b.1697 in Amherst, Cumberland Co., Nova Scotia, and Madeleine Doucet b.1706 in Amherst, Cumberland Co., Nova Scotia. Reference: Stephen A. 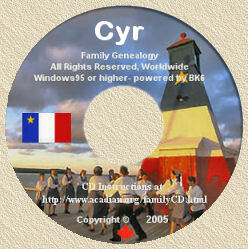 White Dictionnaire Genealogiques des Familles Acadiennes. Publication: Centre D'Etudes Acadiennes, Universite de Moncton. Charles Joseph Richard was born Dec. 28 1759 in Amherst ,Cumberland, N.S and died 1825. He married Susanne Wulf b.1762. She was the daughter of Augustin wulf and Catherine Querine. Reference: Vital records, St. Peter's Church Parish Records, Halifax, Nova Scotia, Canada. Text [Listed as Joseph Richard in son Benjamin's marriage]. Notes from Stephen A. White ,Universite de Moncton: Abraham Gerrior's wife Ludivine Fougere is the daughter Michel Fougere and Adele Richard. More about Michel Fougere. Michel Fougere is the son Jacques Fougere b. 1759 in Nova Scotia and Marie Madeleine Petitpas b. 1765 in Nova Scotia. Jacques Fougere b. 1759 is the son Joseph Fougere and Marguerite Coste. Marguerite Coste is the Daughter of Jacques Coste b. Nov. 10, 1705 and Francoise Petitpas b. 1706. Francoise Petitpas is the Daughter of Claude Petitpas b. 1663 in Nova Scotia and Marie Therese Amerindian Mi'kmaq b. 1668 in the Indian Nation , Nova Scotia. Marie Madeleine Petitpas b. 1765 is the daughter of Jean Baptiste Petitpas b. 1722 in Nova Scotia and Francoise Bertaud b. 1727 in Nova Scotia. Francoise Bertaud is the daughter of Pierre Bertaud and Marie Martin b.1695 Nova Scotia. Marie Martin is the daughter of Pierre Martin b.abt 1662 in Nova Scotia and Anne Godin born abt. 1672 in Montreal, Quebec. Pierre Martin is the son of Pierre Martin b. Oct.5, 1632 and Anne Questnorouest Amerindian Abenaki b.1644 in the Indian Nation Nova Scotia. Abraham Gerroir was the son of Luc Gerroir born abt. 1786 in Tracadie N.S and Anne Jacquet born abt. 1788 in Tracadie N.S. Luc Gerroir was the son of Francois Gerroir born abt.1753 in Chezzetcook, N.S and Marguerite Petitpas born abt. 1767 in Chezzetcook, N.S. Anne Jacquet is the daughter of Jean Baptiste Jaquet b. 12 July 1761 in Lavaltrie, Quebec and Agnes (Anne) Coste born 1 April 1764 in Arichat, Richmond Co. Nova Scotia. Agnes (Anne) Coste born 1764 in Arichat, Richmond Co. Nova Scotia is the Daughter of Claude Coste born bet. 1730-1734 in Port Toulouse, Nova Scotia and Marguerite Vigneau born 24 Sept. 1734 in Port Toulouse, Nova Scotia. Claude Coste is the son of Jacques (Jacob) Coste and Francoise Petitpas . Francoise Petitpas is the daughter of Marie Therese Amerindian ( Mi'kmaq). Marie Therese was born in 1668 in the Mi'kmaq Indian Nation, Nova Scotia. She died abt.1717. She Married Claude Petitpas in 1685 in Nova Scotia. Reference: Dictionnaire Genealogiques des Familles Acadiennes: Publication: Centre d'Etudes Acadiennes, Universite' de Moncton Text: [Amerindienne], Author: Stephen A. White, Universite de Moncton. Abraham Gerrior was born in 1817 in Molasses Harbour, Guysborough Co. Nova Scotia. He married Ludivine (Divine) Fougere. She was born in 1823 in Molasses Harbor, Guysborough Co.. Nova Scotia. William Gerrior was born in 1847 in Molasses Harbour, Nova Scotia. He Married Sophie Pellerin born in 1847 in Molasses Harbour, Nova Scotia. Comments: Census-1871-202-d-188-193.Celebrants: Felex van Blerk, R. Catholic. Marriages: PANS-16184-1867/68-47. Baptisms: 115-5, 126-4, 149-1, 252-1, 265-2, 282-6. Deaths: PANS-16522-1868-159. Joseph Mius was born in 1680 and died in 1729 in Annapolis County, Nova Scotia. He Married Marie Amirault in 1700. Marie was born in 1684. Reference: Dictionnaire Genealogiques des Familles Acadienne. [MIUS section] Publication: Centre d'Etudes Acadiennes, Universite' de Moncton. Author: Stephen A. White. Special Note: Joseph's Brother Francois Mius b.1681 became Chief of the Indians of Le Have. A Treaty was signed by Francois Mius in 1761 that is still honored today. REF: Minister of Indian and Northern Affairs, Hon. Robert Nault. Charles Amond Muise b. 1701 d.1795. Charles Amond Muise was born Dec.1701 in Cape Sable, Nova Scotia and died 1795. He married Marie Marthe Hebert January 21 1731 in Cape Sable. Marie Marthe Hebert was Born 1710 in Cape Sable, Nova Scotia. Ref 1: Dictionnaire Genealogique des Familles Acadiennes. Publication: Centre d'Etudes Acadiennes, Universite de Moncton [HEBERT section]. Author: Stephen A. White. Ref 2: Historie et Genealogie des Acadians, 1625-1810 ,Ottawa Editions LEMEAC Inc. 78, 6 vols, p. 1601. Author: Bona Arsenault. Barthelemy Muise was born in 1757 in Baccaro, an Indian village in Cape Sable, N.S. He died 1798. He Married Madeleine Doiron in 1780. Madeleine Doiron was born 17 Aug. 1763. Reference 1: Arsenault, bona, Histoire et Genealogie des Acadians, (Editions LEMEAC Inc. Ottawa 1978), volume 2, Port Royal, page 735. Reference 2: Research of Stephen A. White, Universite de Moncton. Genevieve Muise was born in 1786 and died in Cape Jack, Nova Scotia in 1866. She married Jean Coste on the 25 Sept. 1815 in Tracadie, Antigonish, Nova Scotia. Jean Coste was born 15 Nov. 1760 in Port Toulouse, Nova Scotia. Ref: Conversation with Stephan A. White where he states that Sophie Pellerin's Mother Gertrude Coste is the Daughter of Jean Coste and Genevieve Muise. Jean Coste is the Grandson of Francoise Petitpas born abt. 1706. Francoise Petitpas is a daughter of Marie Therese Amerindian b.1688 in the Indian Nation, Nova Scotia. Ref 2: Histoire et Genealogie des Acadians pg.722, Author: Bona Arsenault. Gertrude Coste b. abt. 1820. Gertrude Coste was born abt.1820 in Havre Boucher, Antigonish, N.S. She Married Louison Pellerin, son of Jean Pellerin And Pelegie Boudrot. with Stephen A. White. He states that the husband of Gertrude Coste, Louison Pellerin, is the son of Jean Robert Pellerin and Pelegie Boudrot. Louison Pellerin born in Nova Scotia, is the son of Jean Robert Pellerin born abt. 1773 in Nova Scotia. He married Pelegie Boudrot abt. 1794 in Nova Scotia. Jean Robert Pellerin is a son of Paul Pellerin born abt. 1738 in Nova Scotia and Marie-Louise Petitpas. Marie-Louise Petitpas is a daughter of Jean Baptiste Petitpas born about 1722 in Nova Scotia and Francoise Bertaud born abt. 1727 in Nova Scotia. Francoise Bertaud is a daughter of Pierre Bertaud and Marie Martin born abt. 1695 in Nova Scotia. Marie Martin is a daughter of Pierre Martin born abt. 1662 and died in 1739 and Anne Godin born abt. 1672 in Montreal, Quebec. Pierre Martin is a son of Pierre Martin born 1632 and Anne Questnorouest Amerindian Abenaki. Anne Questnorouest was a Abenaki Indian woman born in 1644 in the Indian Nation, Nova Scotia and died before the 1686 census. She Married Pierre Martin in 1660 in Nova Scotia. Pierre Martin was born 1632 in Nova Scotia. Reference: Dictionnaire Genealogique des Familles Acadiennes. Publication: Centre d'Etudes Acadiennes, Universite de Moncton. Text: [Amerindienne] Author: Stephen A. White. Special Note: The Names Mius (Muse, Muise, Meuse), Richard, Martin, Young, Joseph, Bernard, Basque and Gloade (Cload, Cloade), are Common surnames among the aboriginal people in Nova Scotia. Sophie Pellerin was born in 1847 in Molasses Harbour. She married William Gerrior born in 1847 in Molasses Harbour on 12 Jan. 1868. Reference: Marriage -PANS - 16184 - 1867/68-47.Deaths: - PANS - 16522 - 1868 - 159. Allen Gerrior was born 4 Oct. 1873 in Molasses Harbour, Larry's River Nova Scotia and died 1950 in Sydney, Nova Scotia. He married Elizabeth Jane Pellerin. She was born 15 Aug. 1883 in Molasses Harbour, Larry's River Nova Scotia and died 1951 in Sydney Nova Scotia. Reference: Listed as Allan Gerrior, husband of Elizabeth Pellerin in son Jerome's Marriage Certificate; listed as Allan Gerroir in wife Elizabeth Gerrior's obituary. Census 1901, Larry's River, Molasses harbour- Dwe 038 fam 038-Allen Girrior - 26 years old - Married, occupation, Fisherman. Listed as Allan Gerrior in death certificate, Curry's Funneral Chapel, Sydney, N.S. Special Notes: Many prominent Mi'kmaq including chiefs of bands or tribes have French names. The Chief of Bear River Frank Meuse and the now deceased Chief Noel Doucette. Chief Frank Meuse has traced his ancestry to Philippe Mius d'Azy. Dr. Elsie Charles Basque is a Mi'kmaq women, mother, Elder and teacher. Toma Young of Eskasoni is a Mi'kmaq Lawyer working on his PHD in Law. Dr. Marie Battiste is a Mi'kmaw educator and professor at the University of Saskatchewan. Pierre Pellerin is a well respected Mi'kmaq RCMP constable. Chiefs from across Canada came in support of constable Pierre Pellerin during the Burnt Church Crisis. Elizabeth Jane Pellerin was born 15 Aug 1883. She was the daughter of Frederick (Bernard) Pellerin born abt.1851 in Molasses Harbour N.S and Margaret Richard born abt. 1858. Margaret Richard was the daughter of Luke Richard born abt. 1835 and Margaret (Lucy) Pellerin born 8 Jan 1854 in Guysborough county, N.S. Luke Richard was the son of Charles Richard and Barbara (Babbie) Coste. Elizabeth's father, Frederick (Bernard) Pellerin, is the son of Anne (Nancy) Coste. Anne (Nancy) Coste born abt. 1825 is the sister of Gertrude Coste born abt. 1820. Charles Richard is the Brother of Adele Richard born 1796. He is a descendant of Francoise Mius born abt. 1678. Francoise Mius is the sister of Indian Chief's Pierre Mius, Mathiew Mius and Francois Mius. Jerome Alfred Gerrior was Born in 1908 in Molasses Harbour, Larry's River, Nova Scotia. He is a descendant of Francoise Mius, Joseph Mius, Charles Amond Mius, Barthelemy Muise, Genevieve Muise, Marie Therese Amerindian Mi'kmaq and Anne Questnorouest Amerindian Abenaki. Stewart Gordon Gerrior was born June 27, 1936 in Sydney, Cape Breton, Nova Scotia. He is the husband of Sarah Patricia Carson born Jan 27, 1938 in Glace Bay, Cape Breton Nova Scotia. Sarah (Sally) Carson was born Jan 27, 1938 in Glace Bay, Nova Scotia. She is the daughter of Edward Carson and Jenny Seward. Edward Carson is the son of William Carson born 1872 in Glace Bay, Nova Scotia and Sarah Campbell. William Carson is the son of David Carson and Mary Elizabeth Young born 1853 in Bras D'or, Cape Breton Nova Scotia. Mary Elizabeth Young was born 1853 in Bras D'or, Cape Breton, Nova Scotia. She is the daughter of Alexander Young born 1821 and Ellen Bragg . Alexander Young is the son of Gabriel Young born 1797 and Mary Dauphney. Gabriel Young born 1797 is the son of Francois Young and Margaret Young. Ref. Marriage records, Land grant petitioners for Lejeune / Young of Bras D'or Cape Breton , Nova Scotia and transcribed by Lark Szick, genealogist. Francois Young was born 1772 in Cape Breton, Nova Scotia and died March 28, 1838 in Cape Breton, Nova Scotia. He is the son of Joseph Young born 1730 in Nova Scotia and Martine Roy born 1738 in Nova Scotia. Special Note: Both Joseph Young and Martina Roy are buried in the Bras D'0r area, Cape Breton, Nova Scotia. Notes: Michel Larche's case as of April 24,1668, in Trois-Rivières, Sieur de la Poterie Demoiselle de la Valliere stood as godfather and godmother, "of a male child, named Michel eight years old, born in Acadia, whose father was French and mother Esquimaux. Inter-marriages between Frenchmen and Indian women were rather frequent at that time. Refernce: Stephen A. White, Dictionnaire Genealogique Des Familles Acadiennes, vol 2. Notes: Constitutional Law II--B.N.A. Act, ss. 91(24),146-Whether Eskimos "Indians." The exclusive legislative jurisdiction of the Dominion Parliament under s. 91(24) of the B.N.A. Act over Indians extends to Eskimos, who, by well-established usage at the time the B.N.A. Act was enacted, were regarded as Indians throughout British North America and it is immaterial that there were no Eskimos within the original confederating Provinces for the B.N.A. Act (s. 146) provided for the inclusion of the Hudson's Bay Co. lands, where the Eskimos then resided. Martine Roy was born Sept. 1738 in Nova Scotia, Canada. She is the daughter of Charles Roy born 1698 in Annapolis Royal, Nova Scotia and Marie Charlotte Chauvet born 1700 in Nova Scotia. Charles Roy was born 1698 in Annapolis Royal Nova Scotia. He is the son of Jean Roy born abt. 1651 and Marie Aubois born abt. 1665 in the Mi'kmaq Indian Nation, Nova Scotia, Canada. The Name "Aubois" or (To The Woods), was often assigned to the First People. Marie Charlotte Chauvet was born 1700 in Pisiguit, Nova Scotia. She is the Daughter of Charles Chauvet and Agnes Joseph. Agnes Joseph was born 1686 in Annapolis Royal, Nova Scotia. She is the Daughter of Francois Joseph born abt. 1655 in the Indian Nation, Nova Scotia and Jeanne LeJeune born abt. 1659 in the Indian Nation, Nova Scotia. Histoire et Genealogie des Acadien, volume # 2 states that both Francois Joseph and his wife Jeanne LeJeune were... "both Indians". [Author, Bona Arsenault]. Joseph Young was born in 1730 in Nova Scotia and died after 1811 in Nova Scotia. He is the son of Germain LeJeune born 1693 in LeHave Nova Scotia and Marie Guedry born abt. 1712 in Nova Scotia. Marie Guedry was born abt. 1712 in Nova Scotia. She is the daughter of Jean Baptiste Guedry born abt. 1684 in Nova Scotia and Madeleine Mius born abt. 1694 in Cape Sable Nova Scotia. Ref. Research of Stephen A. White, Universite de Moncton. Madeleine Mius was born abt. 1694 in Cape Sable, Nova Scotia. She is the daughter of Philippe Mius d'Azy and Marie Amerindian Mi'kmaq. She is the sister of Joseph Mius, Francoise Mius and Chiefs Pierre Mius, Francois Mius and Mathew Mius. Francois Young married Margaret Young on September 17, 1793 in Bras D'or, Cape Breton, Nova Scotia. Stewart (Jerry) Gerrior b. November 16 1959 in Sydney Nova Scotia. I am grateful to Jerry Gerrior (above) for having provided me the above-noted and permission to reproduce same here. Pubnico is located in what was called, before the Expulsion, Cape Sable, which, even at the beginning, around 1614, had as its center what is now Port La Tour, called then Port Lomeron, David Lomerson having here a trading post, dealing with fur and fish. Charles de Biencourt, who was at the head of the small group of Frenchmen of what was then Acadia, comprising the south-western part of the peninsula, died around 1624. In 1631, Louis XIII named as Governor of Acadia, Charles de La Tour, who had been a faithful companion of Charles de Biencourt. It is then that the name of Port Lomerson was changed to Port La Tour. He was named Governor of Acadia again in 1651, while in France, from where he came back, bringing with him Philippe Mius dEntremont, who was to be his Major. It is Philippe Mius dEntremont who was to be the founder of Pubnico. In 1653, Charles de La Tour gave to Philippe Mius dEntremont the choice to settle wherever he would like. He chose what was then known to the Indians as Pobomcoup, meaning "a place where holes have been made through the ice to fish." Charles de La Tour built the place into a barony, the first ever constituted in Acadia, and the second in all of Canada. He gave to Philippe Mius dEntremont the title of Baron. The center of the barony was located on the east side of the harbor, not far from its head. It was in this same year, 1653, that Philippe Mius dEntremont came to live here with his wife, Madeleine Helie and their daughter Marguerite, who was born in France and was to become the wife of Pierre Melanson, the founder of Grand-Pre. It is here that were born Philippe Mius dEntremonts three sons, Jacques, Abraham and Philippe, and Madeleine, the youngest of the family. We know very little of Philippes life at the Barony until 1671. The census of that year lists his family names and livestock of 26 horned cattle, 29 sheep, 12 goats and 20 pigs on six acres of land under cultivation. In 1675, a crew of Dutchmen landed and invaded Pubnico and took possession of Philippes riches. He left shortly thereafter. In 1670 after Acadia became under French domain once again, he was appointed the Kings Attorney General of Acadia, an office and title he was to hold until his retirement. In this position, he was to travel as an aide to the governor; and that is why he did not stay long at the Barony, and in 1678, we find him in Port Royal with his family. In 1679 Philippe is found at Beaubassin (Amhurst) where Michel Le Neuf, Sieur de la Vallire resided. In 1684 Philippe was again at Port Royal, since Francis Perrot was named governor and chose Port Royal as his residence. In 1687, Philippe retired to Grand Pre where his daughter, Marie Marguerite and her husband, Pierre Melanson (brother to Charles) was living.. This couple were the founders of Grand Pre in 1680. It is here Philippe died in 1700. His wife had died about 1670. It was his eldest son Jacques who built at the center of the barony the manor house, which stood till the time of the Expulsion. It is here that he brought up his family. The Barony of Pobomcoup was devastated and burned to the ground by the English in September of 1758. As to Abraham, although he had a large family, his children did not leave any descendants. Jacques descendants dropped the name Mius, to keep only as a surname the name of dEntremont. The youngest son, Philippe kept only Mius as his surname and is the ancestor of the Mius family, now spelled Muise or Meuse, which was the real patronymic or family name. He married two Micmac Indian wives, both of whom seem to have been given the name of Marie. He established himself at first on the eastern shore of what is now the Bay of Barrington. His oldest son Joseph is the father of the Acadien Mius family of today. All of his other children integrated into the Micmac tribe leaving Joseph to take residence in Pobomcoup. The information above, is made available by 'Le Musee Acadien', W. Pubnico, Nova Scotia, based on research published by Father Clarence dEntremont.